Even though the holidays are quickly closing in on us, Felkerino and I made a joint escape from our chores on Saturday to do a century ride. 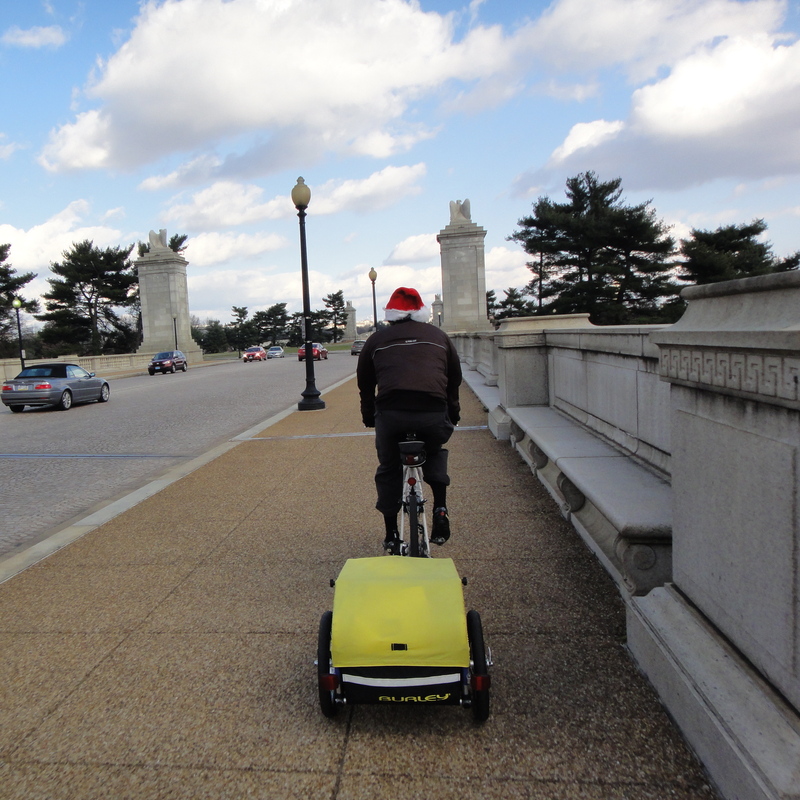 We then made up for our day at play by doing car-free errands on Sunday, including a few with the Burley trailer. 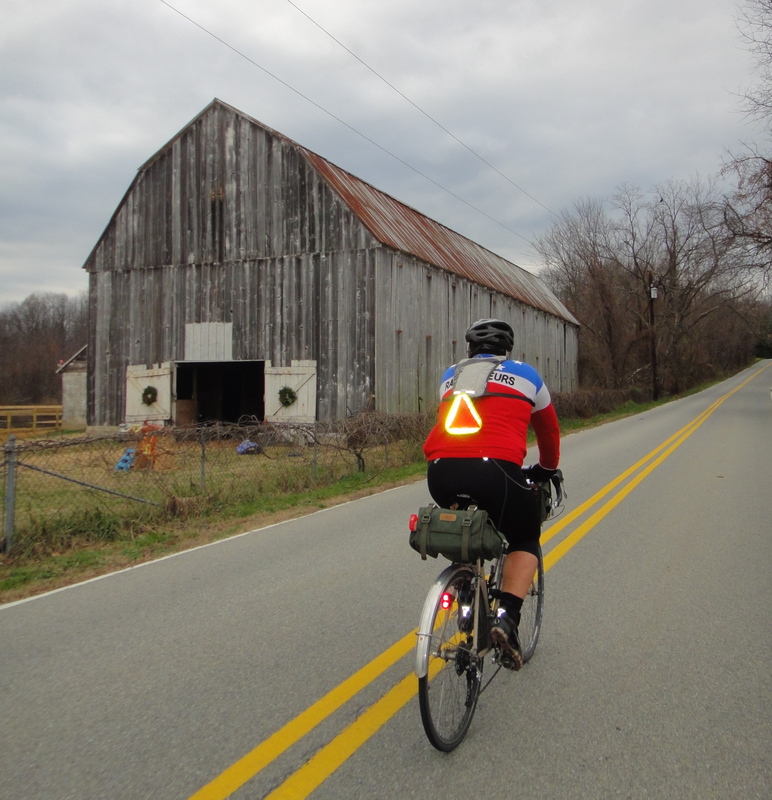 Saturday, Felkerino and I met up with Mike B., fellow D.C. Randonneur and Severna Park Peloton member, for a 97-mile jaunt out of Crofton, Maryland. 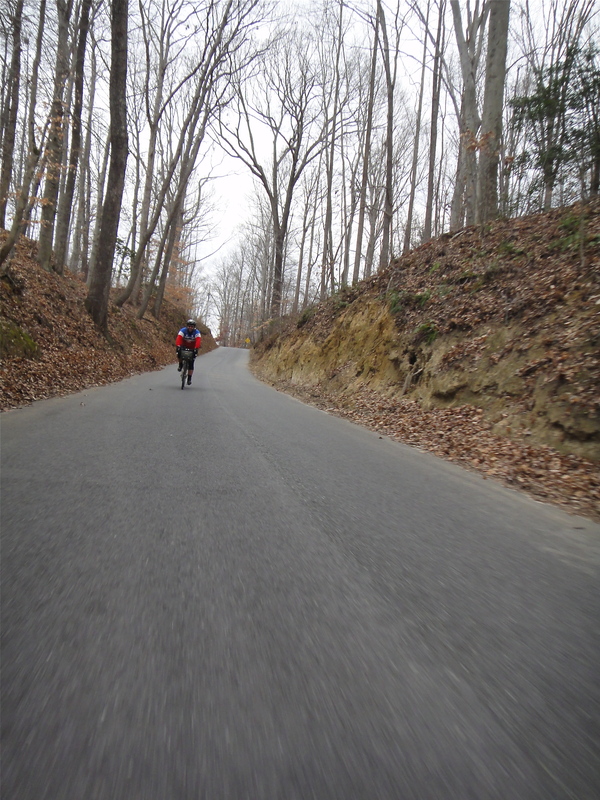 Course description: rolling; no mountains; a few busy suburban roads; and several quiet, rolling, wooded sections. Overall, it was a great ride considering it started from such a built up area. Out and about with Mike B. Although the weather people filled our heads with hopeful lies of sunny skies and mid-forties, the temperatures stayed in the 30s all day, and the sun popped out for maybe the last hour of our ride. For most of the day, it was pretty much cloudy and cold, but not that awful cold where as soon as you stop you immediately freeze. No, it was that less severe cold where if you are off the bike for more than fifteen minutes, you wonder why you bothered since your hands and toes will have to go through their painful retingling warmup process. Kmart was only two miles away so we pedaled there to pick out a hopefully-not-too-nerdy helmet. Mike encouraged me to pick a SpongeBob helmet, but (unfortunately?) those did not come in adult sizes and I ended up with a sturdy Schwinn helmet that was not too awful. Good enough to get me through the ride. 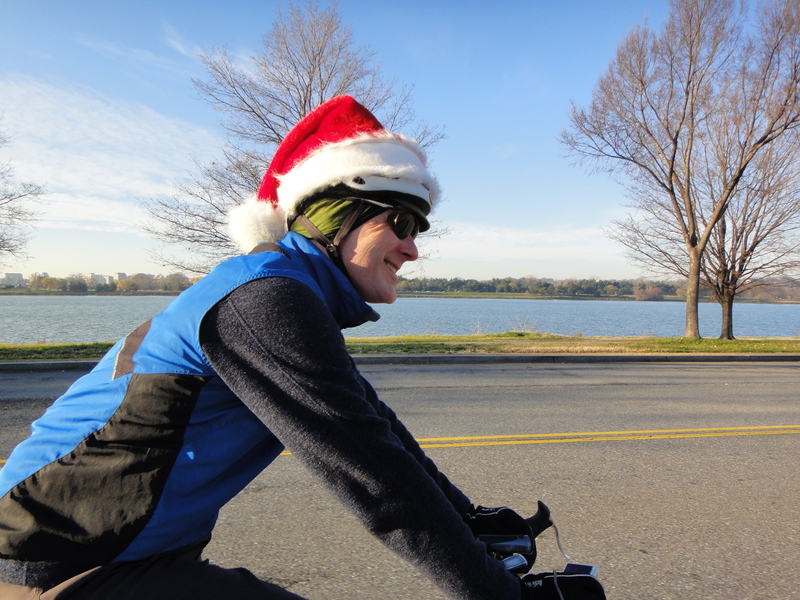 Mike put together an excellent writeup of our outing over at Chesapeake Sailor so I’ll leave him to give the details of our day, including the fantastic Severna Park Peleton holiday party later that evening! Felkerino’s photos of the party are here. It was a fine day on the bike and Mike B. is great riding company! My full set of pics are over at my flickr site. Felkerino took shots, too, but no flickr sitings of them as of yet. Sunday, Felkerino and I made it out for another righteous grocery run with the Burley Nomad trailer. That thing is awesome, except that its right wheel kept falling off early in the ride because it was not screwed down tightly enough. That was sort of exciting. We’d ride along and then I’d here this “KRR!” KRRRKKKK” scraping noise and catch a glimpse of Felkerino stopping with the wheel somewhere off in the vicinity. Great. The second time it happened, a nice passerby picked it up for us, and told Ed that she didn’t want “Santa to lose his sleigh.” Ed and I have been wearing our Santa helmets cover this month, and it’s really engendering some positive feedback. How do you make a Santa helmet cover? Go to your nearest Santa hat store, buy a four dollar polyester Santa hat, and yank it down as hard as you can over your helmet. It will either break or eventually fit. Ours both did the latter. Because they are a thick poly, they get a little hot, making them ideal for either shorter rides or cold December days. Back to the Burley trailer. We figured out we really had to screw that wheel in tight and the rest of our trip passed uneventfully. We filled up the trailer with three heavy bags of groceries and rode the six miles back home to unload them and revel in how awesome we were to go grocery shopping on our bikes. On the return from the grocery store, we passed by Arlington Cemetery, where Wreaths Across America had placed wreaths along the graves. Arlington National Cemetery. 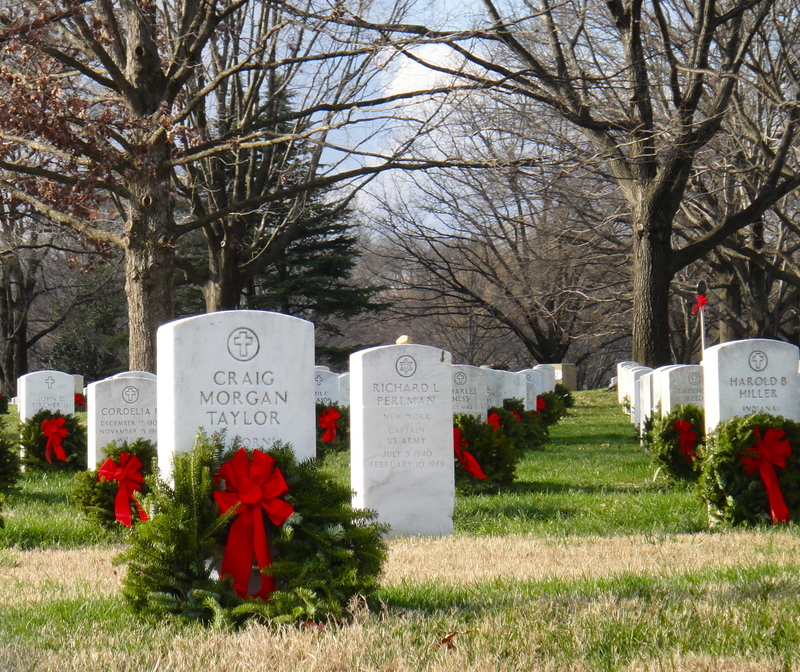 Wreaths Across America: Remember, Honor, and Teach. It was a lovely weekend of solid training miles (training for what, I’m not sure), errand running, and a little holiday excitement and sight-seeing. Famous D.C. Bike Blogger Rendezvous (Tales from the Sharrows)! You both make great company too!! Have a wonderful Christmas Ed and Mary!!! We should meet up for a Burley Nomad ride!! I use mine all over Arlington, and it really adds a whole other dimension to grocery/household goods shopping. I’ve never had a problem with the wheels and have had mine for over 3 years. I hope you got it to work for you. Hey, Joan! I did not know you had a Burley Nomad, too! I totally agree. It is just SO liberating to have the capacity of the trailer. We figured out the wheel, I think. It just was not screwed on tightly enough.